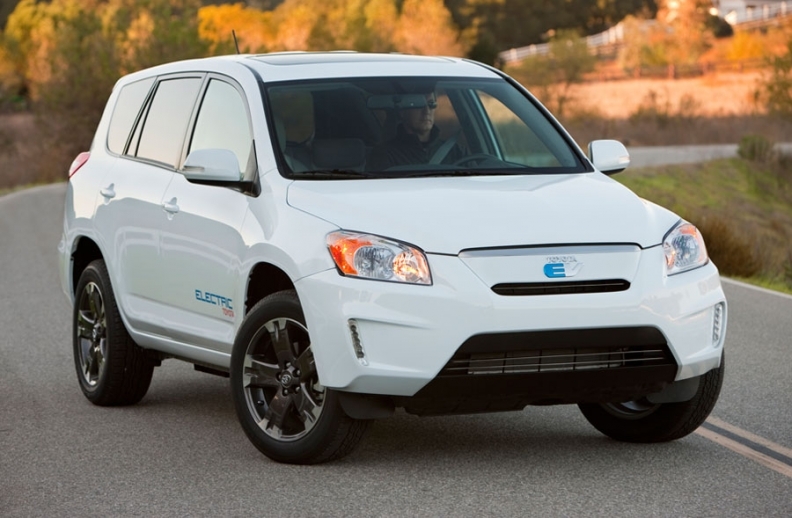 Toyota will use Tesla's small-cell packs in an electric RAV4, shown. Daimler's electric Smarts and Mercedes-Benz A-class cars use Tesla battery packs. TOKYO/LOS ANGELES (Bloomberg) -- Toyota Motor Corp., Daimler AG and BMW AG are turning to laptops for a cheaper way to power their electric cars -- and their sales. Automakers are testing packs of lithium-ion batteries assembled by Silicon Valley startup Tesla Motors Inc. costing less than bigger, car-only batteries favored by General Motors Co., Nissan Motor Co. and Mitsubishi Motors Corp.
A pack of 6,831 cylinder-shaped cells made by Panasonic Corp. powers Tesla's $109,000 Roadster sports car for up to 245 miles (nearly 295km) per charge. The car industry will help lithium-ion battery makers more than triple sales to 5 trillion yen ($60 billion) in a decade from 1.5 trillion yen in the year ending in March, according to Sanyo Electric Co., the world's biggest maker of the batteries. Rechargeable consumer-electronics batteries benefit from an economy of scale that may help cut manufacturing costs and sticker prices in the nascent electric-car industry, said Koji Endo, a Tokyo-based analyst at Advanced Research Japan. EV prices are higher than three-quarters of the autos now sold, according to Bloomberg New Energy Finance, with GM's Chevrolet Volt selling for $41,000 and Nissan's Leaf for $32,780. Electric vehicles cost about twice as much to produce as gasoline-engine cars because the batteries are so expensive, according to consultant Frost & Sullivan Inc. Sales of EVs and hybrids, including plug-in models, will reach about 954,000 worldwide this year, or about 2.2 percent of all car sales, J.D. Power and Associates, an industry forecaster in Westlake Village, California, estimated in October. Government subsidies may help boost sales of plug-in hybrids and EVs to 9 percent of auto sales in 2020, Bloomberg New Energy Finance estimated last month. Panasonic, the majority shareholder in Sanyo, is the main supplier of lithium-ion cells to Tesla and last month bought a $30 million stake in the Palo Alto, California, company. Toyota and Daimler also own Tesla stakes. Panasonic boosted its annual production capacity for the small batteries by 9 percent to 1.4 billion units after opening a plant in Osaka, Japan. The company wants to increase sales of energy-related products because of tougher competition in its television-making business. Packs assembled by Tesla power Daimler's electric Smarts and Mercedes-Benz A-class cars, and Toyota will use Tesla's small-cell packs in an electric RAV4 in 2012. BMW leased 450 Minis powered by laptop cells, and Volkswagen AG studied the technology at its California facility. The larger lithium batteries cost about $700-$800 per kilowatt hour to produce, while mass-produced packs using small laptop cells may cost $200, said Martin Eberhard, Tesla's founder and former chief executive officer. Factories making small cells are running at high capacity, Eberhard said. That also benefits EV makers who don't have the resources to develop their own batteries, said Menahem Anderman, president of Advanced Automotive Batteries, a consulting firm in Oregon House, California. GM partners with South Korea's LG Chem Ltd. for the Volt pack, and Nissan partners with NEC Corp., Japan's biggest personal-computer maker, for the Leaf. Toyota is working with Tesla on the electric RAV4, while its plug-in Prius hybrid and a small, electric car planned for 2012 employ larger batteries. The alliances with Toyota and Daimler helped Tesla generate an initial public offering in June that raised about $226 million. Tesla's shares have surged more than 80 percent this year, compared with an 11 percent increase in the Russell 1000 Index, even though the company has delivered fewer than 1,500 Roadsters since 2008. Shares of Toyota have fallen 15 percent this year, more than a 3 percent decline by Japan's benchmark Nikkei 225 Stock Average. A123 Systems Inc., a Watertown, Massachusetts-based lithium-ion battery maker part-owned by General Electric Co., also is promoting small, cylindrical cells originally designed for power tools. Lithium-ion batteries in consumer electronics have a history of recalls because of overheating that can cause a fire. Nokia Oyj, the world's largest mobile-phone maker, offered in 2007 to replace as many as 46 million Panasonic phone batteries. Panasonic now uses an insulator film between electrodes to limit the risk of overheating, said Yuji Tsuzaki, a spokesman for the battery unit. Sony Corp. recalled 9.6 million lithium-ion cells in 2006 because metal particles that got into cells during manufacturing could cause short circuits and overheating. That remains an issue for Takenobu Inaba, 27, who was shopping at a Nissan showroom in Yokohama, Japan. He said he would choose a gasoline-powered car over an electric one. Roadster owner Scott Painter said he isn't concerned about what's under the hood and hasn't noticed any degradation in the battery since his 2008 purchase.